Boxer and serial batterer of women Floyd Mayweather said yesterday that he doesn't think it was fair that Ray Rice received more than the initial two-game suspension, and that the NFL overreacted to video of Rice cold-cocking his fiancée. "I think there's a lot worse things that go on in other people's households, also," Mayweather said. "It's just not caught on video, if that's safe to say." 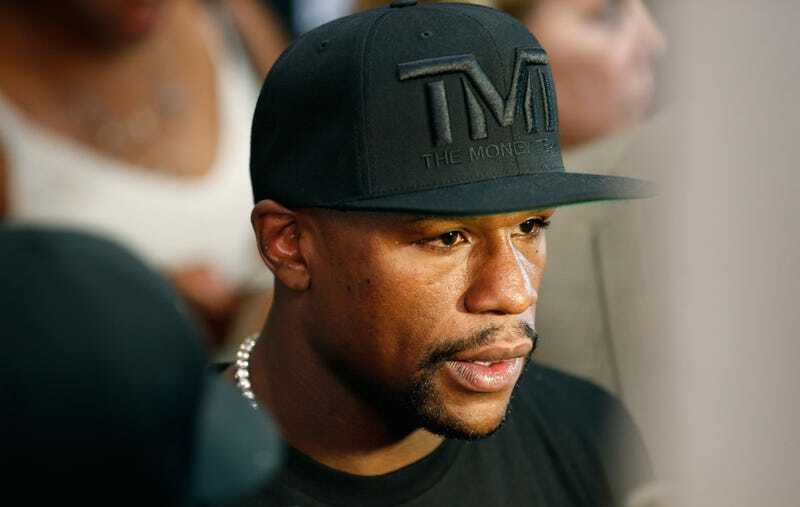 Mayweather, who has been convicted of, pleaded guilty or no contest to, or pleaded down from at least 15 combined counts of domestic violence, battery, harassment, stalking, and violating a protective order, said that he himself has been falsely accused before. "Like I've said in the past, no bumps, no bruises, no nothing," Mayweather said. "With O.J. and Nicole, you seen pictures. With Chris Brown and Rihanna, you seen pictures. With (Chad) Ochocinco and Evelyn, you seen pictures. You guys have yet to see any pictures of a battered woman, a woman who says she was kicked and beaten (by Mayweather). So I just live my life and try to stay positive, and try to become a better person each and every day." Mayweather fights this Saturday, and you really ought to read this before then.